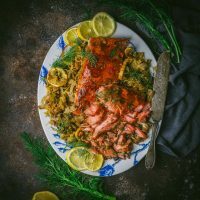 Almost from the beginning of this blog, there have been a number of recipes that we’ve wanted to make, but have lacked the time, ingredients, or frankly, the willingness to tackle. Pork pies are one of those recipes. 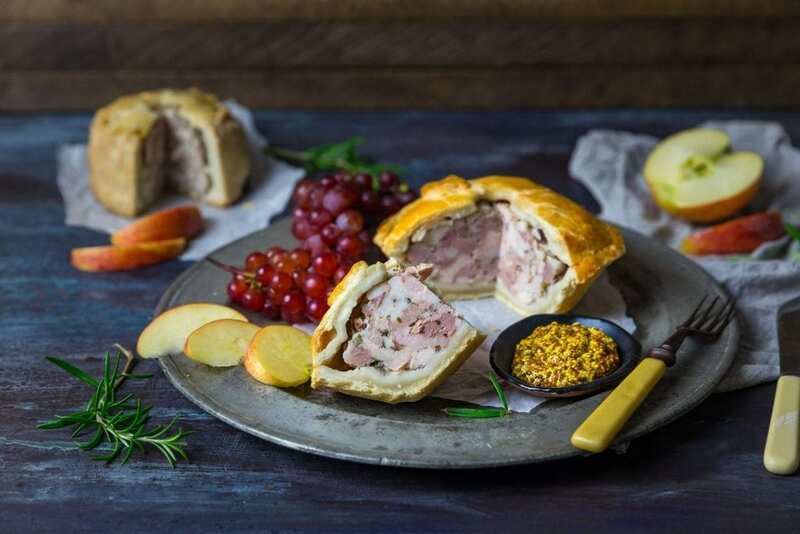 For any of our readers who are unfamiliar, the traditional British pork pie is a hearty, venerated and highly portable vittle served cold and protected from the elements with a robust pastry shell. Between the layer of meat and pastry is a set aspic jelly. At this point, our carnivorous Brit readership (alright, Nathan?) will be slavering and ready for the recipe. More trepidatious American sensibilities might be juggling with the concepts of “cold pork”, “robust pastry” and “aspic jelly”. Fear not, Brad, buddy, all will be explained. Oh? You’re not? Well, you kind of look like a Brad. You just do. Sorry. The United States, while embracing the sweet pie like almost no other country, never quite caught on to the concept of savory pies, whether hot or cold. Chicken pot pie might be about the extent of most Americans’ familiarity with hot meat pies, and as for cold pies, forget it. But believe us, you’re missing out. Yes, it’s true that the idea of the cold pie dates from a time when rural workers would trot off to the fields (barefoot, in the snow, uphill) with their lunch in their pocket, necessitating food that would withstand a few hours of being bumped around (by cows and whatnot) but would provide a hearty good meal and keep their energy up for the barefoot, in the snow, uphill walk home again. It was also a delicious snack for huntsmen, riding their steeds across the rough terrain of the pre-industrial British landscape, occasionally slowing only to whip the occasional barefoot farmworker as they passed. But it doesn’t mean the pie has lost its way in the world. 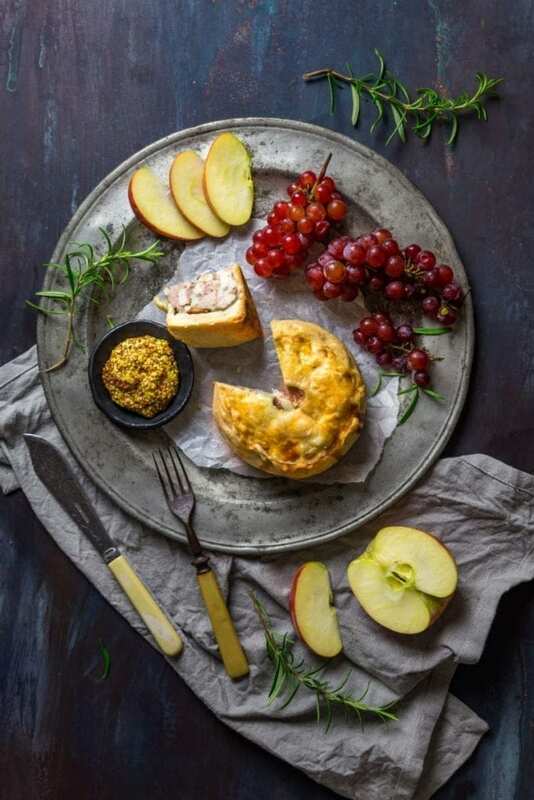 While we still sing about Simple Simon meeting a pieman; while Londoners still accuse you of telling “porkies” (pork pies, lies, innit); while we still do the traditional spoon-wielding pie dance (OK, that’s just me), we can still make room for the humble medieval pie in our 21st-century lives. 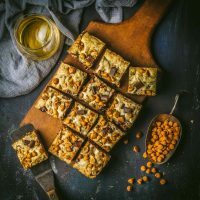 The original inspiration for this recipe comes from Paul Hollywood, who made the process of raising the crusts look ridiculously easy in Great British Bake Off. 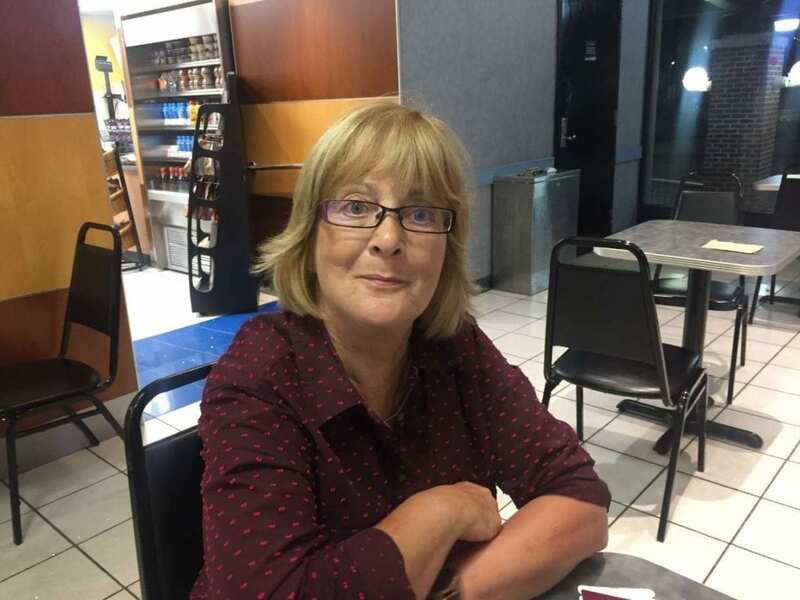 We suspected our version would take all the hardy Britishness we could muster, so we played it safe and brought in an extra dollop of the home country in the form of Matt’s Mum, Ingrid. 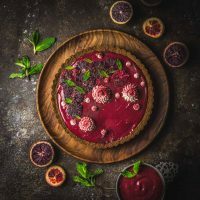 Aside from the fact that the dish is served cold, the primary characteristic of these pies is the pastry: unsupported by a baking dish, it is raised by hand around a mould, and has to withstand the bake without collapsing in on itself. In fact, originally, the pastry wasn’t made to be edible: it was purely a disposable casing to protect the meaty innards. Nowadays we like our pastry eaten, rather than discarded, so we make sure it’s crisp, buttery, and delicious, as well as serving a practical purpose. When researching the process required for assembling a pork pie, the second requirement (other than Mum, of course) was the wooden mould, or pie dolly, that would be used to shape the pastry crust. Because we only have one, we combined it with some Ball/mason-style 1-pint wide mouth canning jars. These both work well, but have slightly different raising methods, as we’ll explain below. Wooden pie dolly with jam jars. First, a note about hot-water-crust pastry. You’ll recall from our historical digression about farmworkers and huntsmen that pork pies need to be robust. A shortcrust or puff-pastry shell is just going to shatter if you look at it sideways, never mind withstanding a baking process by itself. The pastry for this pie is made by melting lard into hot water and mixing the emulsified result into flour. You can also use beef suet, but lard is more widely available and works just as well. Unlike a “cold water” pastry where temperature and mixing method must be crucially controlled to maintain the resultant delicate texture, you can make the hot water variety with giddy abandon – you can have hot hands, your kitchen can be humid, you can thump the dough around – doesn’t matter, it’ll all come together a lot more easily than you think. The texture of the dough is very soft – and, of course, it’s warm! – so it does take some getting used to working with. 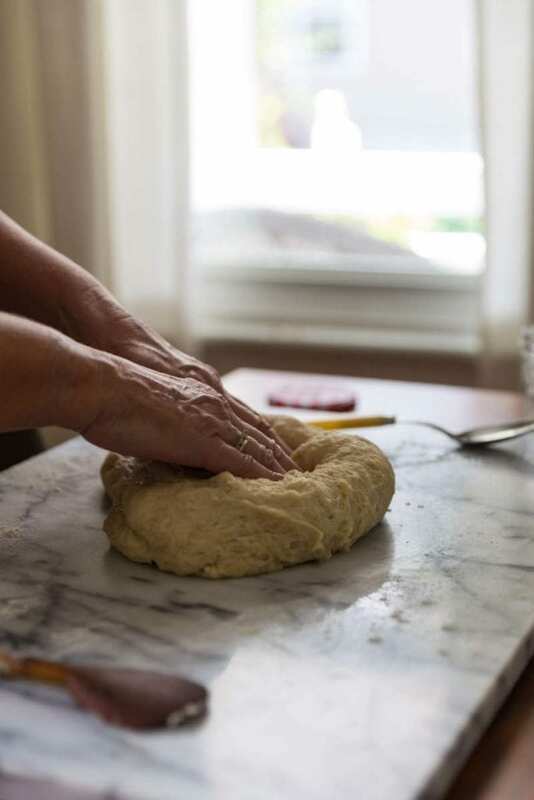 Once it’s formed (we recommend you do the first steps in a food mixer with dough hook), knead it for a few minutes with your hands to get the gluten activated, until it’s a well-defined ball. Our dough amount makes about 6 small pies, so split the dough evenly and form it into balls. Alternatively, you could make one enormous pie, provided that you have a mould large enough. With the large pie, you will need to make sure the filling cooks properly (see temperatures below). You can take off a little dough from each portion now to form a lid, but you may also find you have enough left over once you trim the tops of the molds. Flatten each ball slightly onto a flat surface (we like marble because it doesn’t stick to the dough). You’ll want to flour or oil the mold or jar fairly well (but shake off any excess flour). Push your mold down onto the circle of dough. You’re looking for a bare quarter inch thickness, so don’t press the dolly or jar down too firmly. With our initial batch of pies, we erred on the side of thinness for the base. This was a mistake, since it led to tears in the bottom of the baked shell which let the hot jelly seep through. 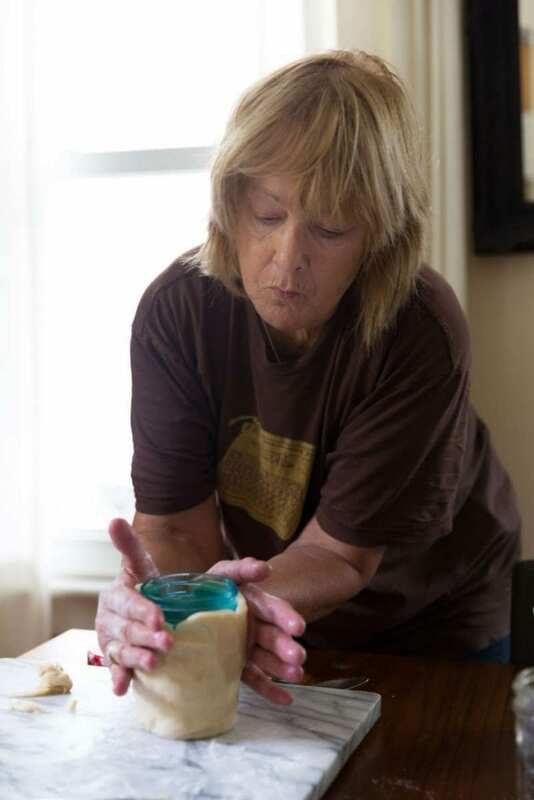 Using your hands, bring the dough up the sides of the mold, making sure the thickness remains even all the way up. You can spin the mold while you’re doing this, as though you were using a potter’s wheel! Once you’re satisfied that the shells are even, trim the tops so that the height of each shell is about halfway up the molds. If you didn’t create separate lids earlier, use this excess trimmed dough to create round, flat shapes the same diameter as your molds. You should also cut holes in their centers which will later be used to pour in the jelly (we used the small end of an icing tip). Chill the dough on the molds at this step – we left them in the fridge for an hour. For your next trick, you have to get the shells off the molds. 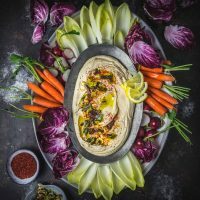 If you’re using the wooden dolly, it’s a matter of carefully wedging a thin, flat spatula or cake knife down inside the shell, and gently manipulating the dough off the dolly sides until it’s released. You might need to give the dolly a few shakes to complete the separation (this is where pre-flouring comes in very handy). For the jam jars, there’s an additional option: put hot water inside the jars to loosen the pastry. Initially, we let the hot water sit in the jars for a full minute, but this allowed the lard to completely soften and collapse the pastry. For the second batch, we poured hot water into the jars, swilled them around for just a few seconds, then poured the water straight out. This allowed the jars to warm enough to loosen, but not melt, the dough. 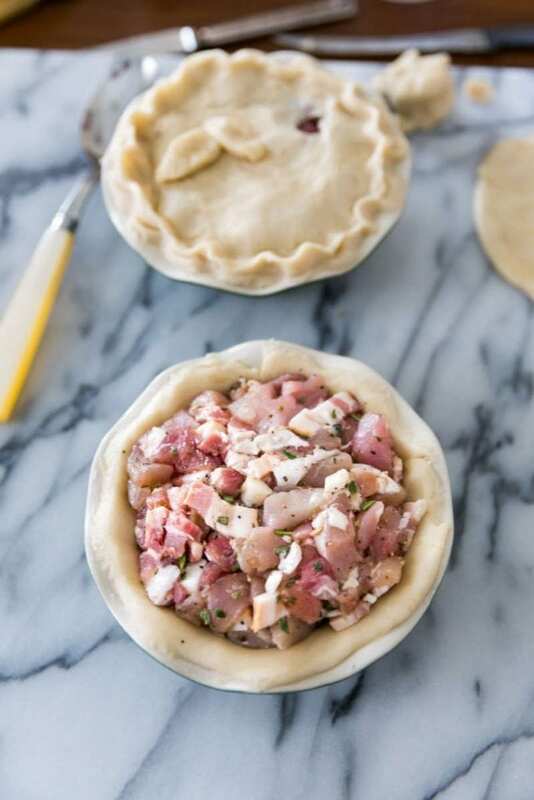 The process of filling pork pies is the same whether you have hand-raised or supported crusts, but for the former, you’ll want to make sure the initial dollop of pork (say, about a quarter of the total) is pushed firmly into the base and bottom edges of the pie. A solid footing of meat filling will help to support the shell while it’s baking. You can fill the rest of the shell more lightly, remembering that we’re going to add the aspic once it’s cooked, which will fill in any gaps. Do fill up to the top of the shell, though (the filling will shrink a little as it cooks). Finally, add the pastry lid with its center hole, and crimp it tightly to the edges of the molded wall. Brush the top and sides with egg wash. Pop ’em in the oven at 350F. Let’s talk about the aspic. There are a couple of ways you can go with this. We took the long, complicated route but you don’t have to. Here’s the route we took: cover pigs’ trotters, carrots, celery, a bouquet garni, a quartered onion and peppercorns with water, bring to a boil and simmer for a few hours. Remove the solids with a sieve and keep warm until you’re ready for it. This process produces great results, but you need a) enough trotters to give the aspic the gelatin it needs to set (you can also add pork bones to increase the setting effect), and b) three hours. Here’s the short version, which we’re putting in the recipe: warm chicken stock and add gelatin. There, that’s a lot easier, isn’t it? Once the pork pies are fully baked (around an hour, you’ll want the internal temp to be around 150F), pour in your hot jelly, gradually, checking that it’s not seeping out of any gaps in the pastry. (If it is, it’s not the end of the world, as the pork pies will still be delicious, but a complete jelly layer around the meat is ideal). Allow to cool and then refrigerate overnight to allow the jelly to set completely. Slice and serve! 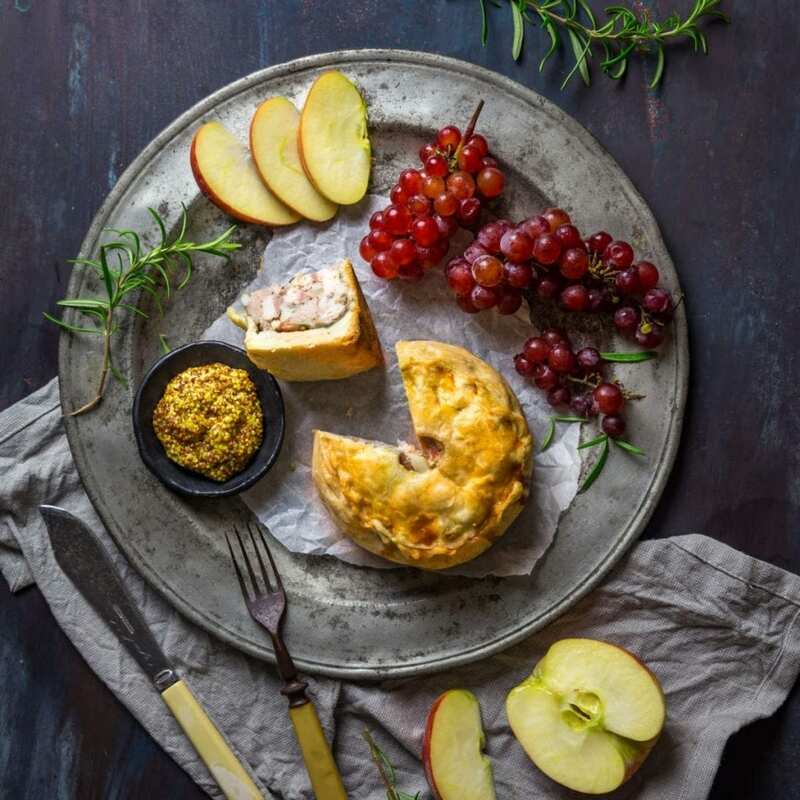 We’re almost out of picnic season, but we still think these pork pies make an ideal portable lunch for an informal outdoor gathering, a casual holiday treat, or country expedition. And if you do meet a pieman going to the fair, for gawd’s sake have a penny ready for him. Make the filling: roughly chop the pork, bacon, and fat into ¼ inch chunks. Mix with herbs and seasoning and set aside. Make the dough: melt the lard in the boiling water. Measure the flour and salt into a large mixing bowl or food mixer, and mix in the butter. Add the dissolved lard and water. Mix with dough hook until the dough comes together. Hand-knead for a few minutes until the dough begins to develop gluten and is no longer sticky. If making separate pies, divide the dough into 6, and remove a small section from each portion for the lid. With each portion, form balls and flatten them onto a floured surface. Push your mold or jam jar into the center of the portion, aiming to make the base about ¼" inch thick. Pull the dough up the sides of the mold, taking care to keep the thickness even all the way around. Using a knife, cut a top edge about halfway up the mold. Form the remaining pastry into rounds the same diameter as the molds, and using a knife or icing tip, create a small hole in the center of each round. Chill the dough on the molds for an hour. Preheat the oven to 350F. Once the dough is chilled, carefully remove the crusts from the molds, taking care not to tear the pastry. Start filling with the pork, pushing the first half cup or so firmly into the base and sides of the shell. Fill the rest more loosely all the way to the top of the shell. Cover the filling with the round pastry lids, and crimp the sides and lids together to seal them. Brush the top and sides with egg wash. Put the pies on a baking dish and place in the oven for about 1 hour. When the pies are almost done, prepare the jelly. Heat the stock in a medium saucepan to a simmer and stir in the gelatin. Once the pies are done, remove them from the oven, and pour the jelly carefully into the top holes until each is filled. Watch out for any leaks in the bottom of the casing! Let the pies cool to room temperature, then place in the fridge and allow to thoroughly cool overnight to set. I was researching pork pies and came across your write-up. I gave you 5 stars for it! I haven’t tried making the, but it was entertaining enough for me take the time to leave a reply. made these as per the recipe exactly…the pies did not want to accept the broth. adding it a tablespoon at a time got pretty tedious–then the buggers had the audacity to pretend that they were full after only 1/4 per pie…upon cooling and slicing their deceit was revealed. I found the pies to be a bit salty (probably the bacon), but my Irish friend found them perfect but for a bit too much herbiness (they don’t care for sage it seems). making them again today but augmenting with a bit of chopped greens to lighten up the meaty load. Hoping to get them accepting a bit more broth this time…but it’s a slim hope. I’ve been making Meat Pies in Hot water pastry for a while now. I LOVE them. I originally fell for the beef pies from Cameron’s at our local Scottish Highland games in Georgia USA. with Brown Sauce. since then, I’ve done some research on them and I have made them with all sorts of meats, eating them both hot and cold. we tend to go for hot. I like to toss in some cranberries with the pork pies and just a touch of warm gelatin and stock is lovely eaten with the hot pies, as well. even better, using the stock and gelatin to make a nice ‘pan’ sauce to go with it. When I do Pork Chops, I often have a gorgeous pan sauce of apricot and white wine and butter and nearly always have some left over. and I eat that with a hot pie and it is amazing! another favorite is to make my meat pies with leftovers from the week and make weekend pies. I just love meat pies with and without fruit and beg added. Thank you for thorughly demystifying hand raised hot water crusts. Much appreciated!